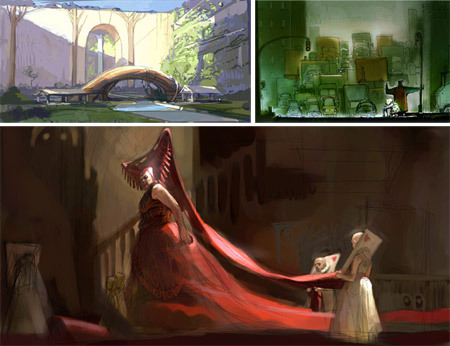 Tritan Elwell is an illustrator who graduated from the High School of Music and Art in New York and went on to attend the School of Visual Arts there on a full scholarship. In addition he worked as an assistant to photorealist painter Charles Bell. He returned to the School of Visual Arts as an instructor, teaching classes in painting and illustration. He has maintained a client list that includes HarperCollins, Penguin, Avon, Pocket Books, Bantam and Tor Books. Tor books has a gallery of his work. He has also been featured in Print, Communication Arts and the Spectrum collections of contemporary fantastic art. Elwell utilizes contrasts, not only of value and color, but of degree of detail, to control how he directs your eye and snaps attention to the focal point of the image. He also maintains a designerly eye to the graphic elements of his images, giving them a balance of positive elements and negative spaces. 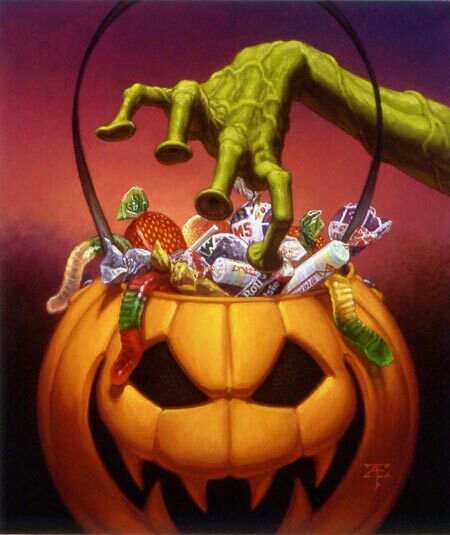 The image shown here is perhaps not as representative of his work as some others might be, but seemed delightfully appropriate for Halloween. I was unable to find a dedicated web site for Elwell, but I’ve gather a list of links to galleries of his work. The study of human anatomy has long been a juncture of art and science. 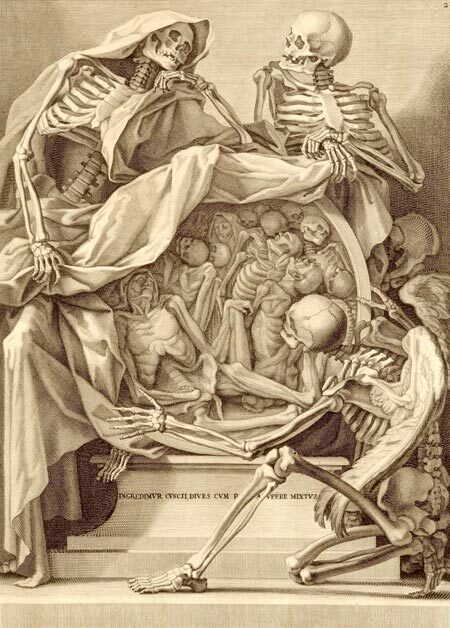 The dissection of cadavers, at times forbidden by the church and state, has been of fascination to artists as much as to those endeavoring to figure out how this wondrous collection of bones, flesh and fluids works. Just as the scientific or medical examination of the body has been of interest to artists working to represent the human form, so artists have played a vital role in recording and making clear those discoveries, a tradition carried on today in the specialties of medical and scientific illustration. Dream Anatomy is a special online feature from the U.S. National Library of Medicine, originally accompanying a physical exhibit at the National Library of Medicine, which explores this relationship and the history of anatomical representation, including a fascinating gallery of anatomical art. Many of the pieces, like the image above, Anatomia per uso et intelligenza del disegno ricercata…, are collaborative works between anatomists and artists, in this case anatomist Bernardino Genga and artist Charles Errard. The exhibit includes a broad range of images, both in the gallery and accompanying articles, from modern anatomical drawing, Renaissance, Baroque and Victorian artists, as well as Aboriginal “skeleton” drawings and contemporary gallery of children’s drawings of “Under Your Skin“. They missed the chance, though, to include some of the representations of “spiritual” anatomy, as seen in the work of visionary painters like Alex Grey and Mati Klarwein. In the image above, I love the foreground figure, apparently an angel, with wing bones connected to the scapulae. Chris Appelhans, who I profiled back in 2006, has added some new images to his site, Froghat Studios, along with a fun short Superman animation. The latter is more of a slide show than an actual animation, but it works quite well, timed to music and with nice touches (I love the scene of Superman doing the Boy Scout thing for an old lady toward the end — image above, top right). There are additional updates to the site including additional concept art for Monster House, the enigmatic and fascinating “Alice in Underworld’ project (image above, bottom) and concept art for what is apparently a movie with a title, or working title, of Highmoon (top left). Appelhans’ site is essentially just a list of links to images. Unfortunately there is still little or no information about the projects or Appelhans himself. I found out about the Superman animation when Joe Gordon, writer for the Forbidden Planet International Blog Log in the UK, wrote to say he had found my previous post about Appelhans in his own search for information about him. You will find an additional, and quite nice, selection of Appelhans’ work, both originals and prints for sale, at Gallery Nucleus. I discovered Luther van Gorder from a striking small painting of his that attracted my attention in the midst of some of the terrific French and American Impressionist work in the current Paths to Impressionism exhibit at the Newark Museum in New Jersey. The piece is called In the Park, showing women strolling in New York’s Central Park around the turn of the 20th Century (left, top); and it’s one of those wonderful combinations of impressionist color and free, open brushwork with the traditional academic draftsmanship and geometric solidity that the French Impressionists rejected to great extent, that exemplifies why I love American Impressionism. The original is in the Worcester Art Museum (from which much of the current exhibit at the Newark Museum is drawn). Van Gorder was from Ohio, studied with the brilliant American Impressionist William Merrit Chase at the Chase School of Art, and under Emile Carolus-Duran, the French painter and atelier master under whom several of the French Impressionists studied, and at the École des Beaux-Arts in Paris. He painted scenes of rural France, urban Paris, particularly its colorful flower markets, and the banks of the New York Sound among other places; and exhibited at the National Academy of Design and The Pennsylvania Academy of the Fine Arts. It’s interesting to compare his Japanese Lanterns (left, bottom) to Sargent’s beautiful Carnation, Lily, Lily, Rose which was likely its inspiration. Van Gorder also studied in London for a time, where he met Sargent and was exposed to the work of Whistler, the influence of which shows in the tonalist character of some of his work. Look what happened indeed. Rahn is an illustrator with an emphasis on the fantastic and otherworldly, who uses painterly textures, atmospheric effects, sharp contrasts of value and color and compositional tension to give his images drama and visual punch. Unfortunately, his bio provides little in the way of actual biographical information, other than the fact that he lives in the San Fransisco Bay area, so I can’t tell you much about what he’s done or who his clients are. I was able to glean a little from his news page — he has apparently done work for Wizards of the Coast, has been published in the Spectrum collections of contemporary fantastic art, and I saw at least one Village Voice cover and a book cover in his portfolio on Lindgren & Smith, so I know he works in those areas. His News section also mentions that he received a scholarship to the annual Illustration Academy in Sarasota in 2007 as part of an award from the NY Society of Illustrators. Looking through his portfolio, you’ll find a variety of subjects, but always a bent for the strange and dramatic. Rahn works both in traditional media, oils and acrylic, and digital painting. His galleries on his own site and on the Lindgren & Smith sites are organized that way. There is also a portfolio of his work on Workbook that is divided, somewhat redundantly, into Fantasy/Sci-Fi and Oil/Acrylics; though it does contain some images not found on the other sites. 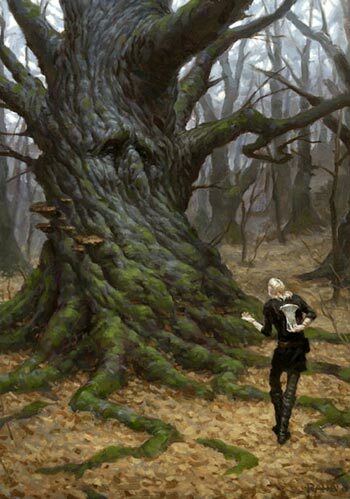 One of the best selections of his work, as is the case with many fantasy and science fiction artists, is in the Tor Books gallery. While I was on the Tor site, I jumped over to Art Director Irene Gallo’s blog, The Art Department, and sure enough, found an interview with Rahn, from which I learned that he received a BA in Illustration from the Academy of Art in San Francisco; and found mention by him of admiration for the work of Jon Foster (also here), whose influence I though I could see in Rahn’s work, particularly in his painterly approach and intriguingly textured backgrounds. Suzanne Duranceu is a Canadian illustrator whose paintings evidence a strong sense of textural detail and a delicate refinement that give them a feeling of presence and gravity. 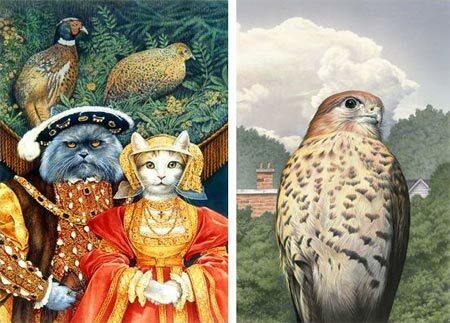 In other hands images like her version of works by Holbein or Gainsborough as represented by cats might lapse into kitsch, but she handles it with such élan that it becomes a naturalistic extension of the painter’s style. Her other work ranges from fanciful to serious, and often makes use of detail and value contrasts to give weight and solidity to otherwise whimsical scenes; like her Newlyweds, the Owl and the Pussycat, enjoying a seaside picnic (presumably with the client’s delightful foodstuffs) before embarking on a honeymoon cruise in their beautiful pea-green dingy. She also has on her site some intricately detailed interpretations of ecosystems (unfortunately in small images), and a fascinating Escher-like series of world views called Trilogy. The web site is apparently still in progress. I found the navigation throughout somewhat problematic, the individual image dots didn’t respond to my click (at least on the Mac), but the Next and Previous arrows seem to work OK. A couple of the sections are still unfinished, including the bio section. For that you can turn to her bio on ZAKS Illustrators Source.